In essence, Imago extracts knowledge from geoscientific imagery using inexpensive, off-the-shelf cameras positioned throughout the mine. These cameras capture a comprehensive dataset of images, which are then matched with other mining data and have the potential to be analysed by cloud-based, machine learning algorithms. The first app, Deswik.GeoTools Mapping, is scheduled for release in March as part of the v2018.1 update of the Deswik Suite. Built for Windows tablets so as to leverage the Deswik.CAD design engine capabilities, the Mapping app allows geologists to create spatially-referenced geological maps with the option to incorporate photographs while offline and underground. These maps can be easily imported into a central Deswik.CAD document to allow geologists to work with the data captured from multiple jobs. 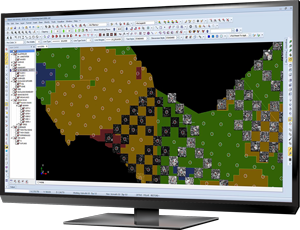 For more information on Deswik.GeoTools or to organize a demo, contact your nearest Deswik office.